Cielo chef and owner Adi Cohen established Cielo over 25 years ago to bring the authentic regional cuisines of Italy to Jerusalem, and he has been doing so with class, elegance and passion ever since. Much like Italian cuisine itself, the backbone of Cielo is the freshest ingredients and impeccable execution. The pastas, sauces and ice cream are handmade on the premises daily, and the vegetables, meat and fish come straight from the market. While you’ll certainly find some familiar dishes,the magic of Cielo’s menu is in the symphony of less prevalent Italian dishes, mainly from the northern Italian kitchen with a few sprinklings of Neopolitan cuisine — whole and filleted fish, seafood, veal and succulent tournedo cuts of beef in a variety of delicate, yet flavorful sauces and seasonings. Chef Cohen has also crafted a wonderful wine selection to complement the menu. And of course, who can forget about dessert? Traditional Italian torta, chocolate mousse, creme caramel and homemade gelato are waiting at the end of your meal to be paired with a shot of espresso and limoncello or grappa. Just like the food, the atmosphere is authentic, thoughtful and romantic with a quaint and cozy space, elegant table settings and cutlery, inlaid wood tables and soothing classical music in the background that transports you from the streets of Jerusalem to the charming Italian countryside. 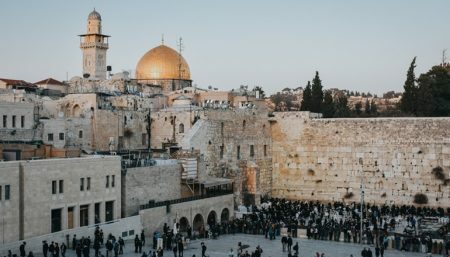 The atmosphere has made it a Jerusalem favorite for romantic dates and family celebrations. With a capacity of 30 people, Cielo is an ideal venue for intimate events. Adi Cohen has been the head chef and owner of Cielo since he opened the restaurant in 1992. With roots in Italy, he focuses on the cuisine of northern Italy with a touch of the Neopolitan kitchen. Ok I had enough of Great Hummus, Pita Bread and the usual food in Israel ( although I can’t complain). I was craving Italian and just by accident found Cielo! No the concierge at King David (where we stayed) didn’t tell us, we just found it ourselves! !Sometimes exploring comes up with the Greatest Surprises. It’s a quiet, quaint... Mom and Pop kinda place. Delicious in every way!!! From the salads to the soup and scrumptious Italian dishes..... all the way to the Dessert. Can you believe probably the best Flan we have ever had? Hard to believe since Miami usually has the best. Anything you want or crave, they have. Just down the street from the Mamilla. Easy to find. A Great Italian Find!!! We went for dinner, having got the concierge at our hotel to make a reservation for us. The restaurant is very small so reservations are essential. It was a cool evening so we decided on some hearty pasta dishes. Both the lasagne and the penne arrabiata were fresh and excellently prepared and presented. While the wine list featured some quite expensive choices we enjoyed the house red wine by the glass. The service was professional and unobtrusive. The evening ended very nicely with a free glass each of house made limoncello. Overall a very good experience.